Make Persimmons for your baby with our homemade persimmon baby food recipe ideas. Learn about introducing persimmons and feeding your baby persimmons! How Much Will Your Baby Eat? Does Baby Refuse to be Spoonfed? Help My Baby is Orange! Persimmons are native to China and made their way to Japan and Korea. It is said the persimmon found its way to California in the early 1800’s. These fruits are bursting with flavor and Vitamin C. One little persimmon contains almost 17 mg of Vitamin C! This fruit is great to serve to your little one to aid in Iron absorption. When can I introduce Persimmons to my baby? Persimmons would be a great addition to your little one’s diet around 8-10 months of age. They are not known to be highly allergenic and are tasty and simple to prepare. As always, be sure to consult your pediatrician about introducing foods to your baby! According to the EWG, persimmons are not one of the “dirty dozen” foods that are most highly contaminated with pesticides – purchasing organic is a personal choice. 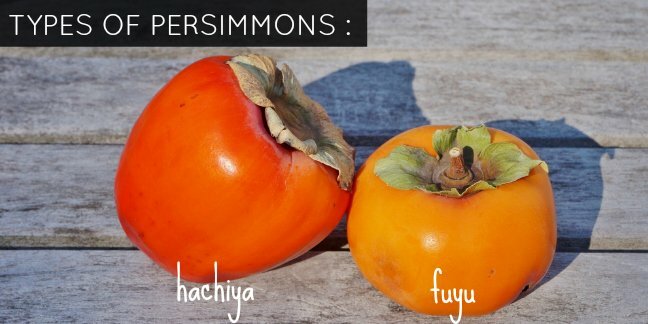 There are 2 types of persimmon, the Fuyu and the Hachiya. They are typically “in season” in the U.S. between November and December but they may start popping up at your grocery story in September. The Hachiya can be very bitter if it is not fully ripened due to the tannins it contains. 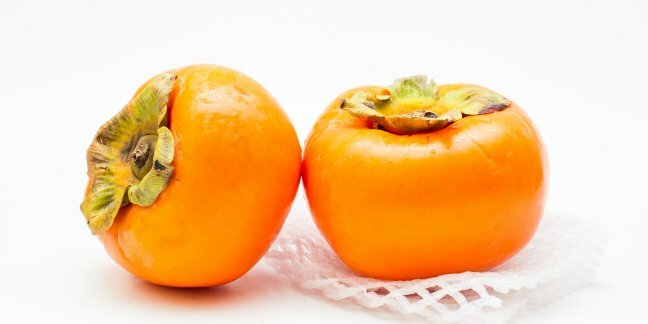 Hachiya persimmons are often picked when they are not ripe so that they can withstand shipping. You can ripen these persimmons in a brown paper bag, storing them at room temperature on your counter for a few days. This persimmon is a bright orange color and when ripe, it is very squishy, like a water balloon or like jello. The Fuyu is yellowish-orange and firm when ripe. They are safe to store for up to 3 weeks and may get sweeter as time passes. Once they are very squishy, toss them out. Best Way to Prepare, Cook and Serve Persimmons for Baby Food? The Hachiya persimmon is served pureed, mostly in baked goods or incorporated into other dishes. The skin of this persimmon is very thin so you really don’t need to peel it. Wash thoroughly, steam if desired and then puree. The Fuyu can be eaten like an apple or a pear, no need to peel or cook it. This persimmon may also be steamed and then pureed if desired. Step 1: Place all of the above ingredients in a medium sized pot. Bring the pot to boil and then turn down to simmer. Step 2: Simmer until liquid is absorbed, approximately 15-20 minutes. Puree if needed then serve. Step 1: Mix yogurt and persimmon together then blend until a texture good for your baby is achieved. Step 2: Serve mixed into chicken or other fruits and veggies or as a ‘meal” or snack. Remember, always consult with your pediatrician regarding introducing solid foods to your baby and specifically discuss any foods that may pose allergy risks for your baby. © Copyright 2003-2019 TotallyHer Media, LLC. All Rights Reserved. Information on wholesomebabyfood.com is presented for educational purposes only. While the information published on this site is believed to be accurate, it is not intended to substitute for professional medical advice. Statements and opinions expressed should not be considered facts to replace those from your qualified health care provider. Contents of this website may be reproduced only for personal use and may not appear on other websites or in other electronic formats. Contents may not be reproduced for other use without the express written consent of TotallyHer Media, LLC.